Tennis is a sport played between two players which is known as singles or between two teams of two players known as doubles. Each player uses a strung racket to strike a hollow rubber ball covered in felt over a net into the opponent's court. The opponent will try to return the ball; it is allowed to bounce once before it is returned. If the ball bounces twice then the player who hit the ball before it bounced twice will get the points. The modern game of tennis originated in the United Kingdom in the late 19th century as 'lawn tennis' and had heavy connections to the ancient game of real tennis. A recent addition to professional tennis has been the adoption of electronic review technology coupled with a point challenge system, which allows a player to contest the line call of a point, a system known as Hawk- Eye. Tennis can be played on grass, clay or other courts either inside or out. 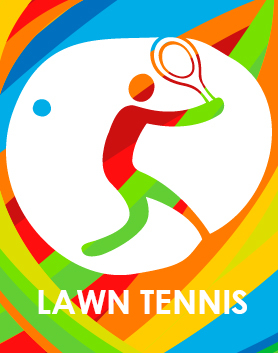 Tennis was first incorporated into the Asian Games in 1958 and 1896 in Summer Olympics.